The most important thing for retailers used to be foot traffic—getting a shopper into a store. Today, shopping happens everywhere: in stores, on the web, on the web while in stores. And it happens all the time, in micro-moments throughout the day and night. In fact, 4 in 5 smartphone holiday shoppers used their phone during spare moments or while doing other activities last year.1 This means that attention is at a premium, and retailers need to be present wherever and whenever someone is shopping. How can retailers make sure they reach shoppers this upcoming holiday season? We looked back at last year's holiday season and analyzed the latest retail trends to help marketers get a head start on their holiday plan. When they start shopping for the holidays, most people—nearly 7 in 10—are totally undecided or considering multiple gift options.2 To get ideas, they used to thumb through catalogs or walk by store windows. But today, oversized catalogs fall under fire, and the web, rich with visuals and videos, is where people go to browse. 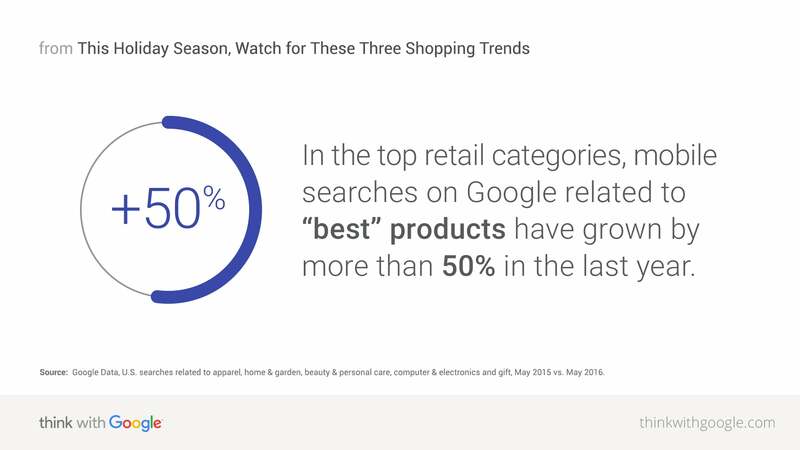 Source: Google/Euromonitor International, "Retail Micro-Moments," U.S., apparel, consumer electronics, home & Garden mobile shoppers, n=500 for each category, Jun. 2016. As shoppers look for the perfect gift this season, there's no one perfect way to reach them. Rather, it'll require a combination of tactics to get their attention. The one common denominator—mobile. It lets marketers be everywhere in every moment. That's true holiday magic. 1 Google/Ipsos, "Post-Holiday Shopping Intentions Study—Total Shoppers Report," base: used smartphone for holiday shopping, n=410, Jan. 2016. 2 Google Consumer Survey, U.S. online population aged 18+, n=1,513, June 2016. 3 Google Data, U.S., classification as "gift guide" video was based on public data such as headlines and tags, and may not account for every such video available on YouTube, Dec. 2015. 4 Google Data, U.S., classification as "gift guide" video was based on public data such as headlines and tags, and may not account for every such video available on YouTube, Oct. 2015–Dec. 2015. 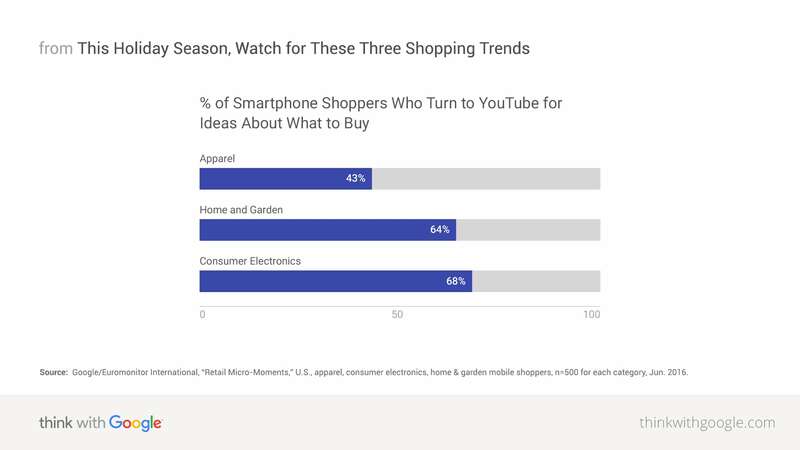 5 Google/Euromonitor International, "Retail Micro-Moments," U.S., apparel, consumer electronics, home & garden mobile shoppers, n=500 for each category, Jun. 2016. 6 Google/Ipsos, "Post-Holiday Shopping Intentions Study—Total Shoppers Report," base: U.S. holiday shoppers, n=1,500, Jan. 2016. 7 Google Data, U.S. searches related to apparel, home & garden, beauty & personal care, computer & electronics and gift, May 2015 vs. May 2016. 8 Google Data, Aggregated, anonymized data from a sample of U.S. users that have turned on Location History, May, 2016.